Good Guys Media and The All England Lawn Tennis Club announce the release of the Wimbledon Official Film 2017. The Official Wimbledon Film 2017 delivers an engaging insight into the very best action, on and off the court, at the most famous and revered tennis tournament in the world. Documenting the progress of former champions, challengers and eventual winners as they progress through the Fortnight, witnessing the shock results unfold and delving into Wimbledon's unique attributes across the Grounds, the Official Wimbledon Film 2017 is an unparalleled account of this iconic two weeks in the British summer calendar. Voiced by esteemed British actor Charles Dance and featuring interviews with the biggest names in the game, we also hear from some of Wimbledon's many characters who bring The Championships together both on and off the courts to make it the distinguished and admired event that it is today. With exclusive access and unique on-court coverage, the Official Wimbledon Film 2017 is a captivating watch which celebrates new records, new champions, and new heroes and heroines as the world's best continue their Pursuit of Greatness. 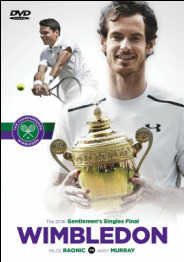 Good Guys Media and the AELTC announce the release of the Wimbledon Gentlemen's Final 2016. Good Guys Media and renowned professional golfer and World Golf Hall of Famer Tom Watson have announced the release of over 20 new lessons for his very popular and successful Lessons of a Lifetime DVD set. Tom Watson Lessons of a Lifetime was released in 2010 and has become one of the best-selling golf instructional video programmes of all time having sold over 70,000 DVD sets in 5 languages in over 40 countries. In extensive surveys conducted with buyers, 88% said the programme had improved their game and 79% rated the programme as excellent. 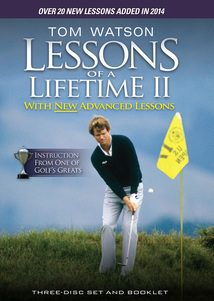 The new lessons cover many advanced topics, including pre-shot routine, the importance of the bottom of the arc, head movement, how to benefit the most with your time on the practice tee, handling pressure, the 40 yard wedge shot, controlling trajectory on chips, chipping with a putting set up, several putting lessons and instruction for kids and seniors. Good Guys Media are releasing the new lessons separately and also combined with the original 2 disc Lessons of a Lifetime programme. Watson has long-standing professional relationships with Adams Golf, Rolex, MasterCard Worldwide, Transamerica, The Greenbrier Resort, Polo Ralph Lauren, Executive AirShare, G/FORE, Golf Digest and Titliest. These instruction programmes were filmed at The Greenbrier Resort.